**And here is the video of it provided by Daniel Palacios (the artist) himself (I prefer my own for THIS post because it shows only on what I’m discussing here): http://vimeo.com/12075151 **. (a) If you are seeing this device, then you are seeing a single rope spinning rapidly through a region of space. (b) What you seem to be seeing is something occupying the surface of a three-dimensional volume within that region. This surface includes more than one point in space, e.g., in the following picture, it includes the area encompassed by the circles ‘A’ and ‘B’. This volume that you seem to see is constantly changing. If you’re seeing the rope, then it is because of the motion of this rope. However, at any one time, the rope is not itself stretching out over that surface it seems to fill. The rope is just a relatively thin (yet elastic) rope which spins quickly about a horizontal axis. And because of that spinning then, at one time, it is at ‘A’ and, at another time, it is at ‘B’. What you see in this video is — obviously — not just what you are seeing when you look at this for real. But when you go and look at the spinning rope — not through YouTube, but just standing in front of it and seeing it — you see in all important respects the same thing as in this video: the apparent filling of the circumference of a volume by something in motion, something which turns out to be the rope. Go and see — visit the science gallery . 1. You seem to see the rope occupying different locations in space. What is moving — in reality, a single rope — seems to be occupying two places at the same time, i.e., it seems to occupy two points in space simultaneously. However, the rope cannot be occupying these two places, or any like them, simultaneously. Instead, this filling of the volume is only from the movement of the rope. The rope is moving from one of these points to the other of these points, but it is never at each at one time. The rope is occupying this surface over or through a multiple of times. And you see it doing that — you see it filling this surface over a multiple of times. This means that this appearance of simultaneous occupancy of these spaces is not of real simultaneity. That in itself doesn’t bother me — and I don’t think it should bother anyone else: ‘apparent simultaneity’ in my view is not an ‘appearance’ at all but the non-appearance of actual duration (read more on this in my 2010a ‘Complex Experience, Relativity and Abandoning Simultaneity’, or even my PhD thesis, where I go into more finicky detail). It also means something else. 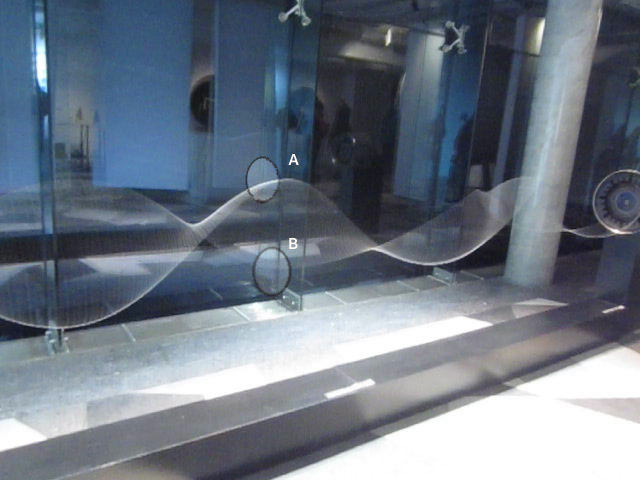 This entry was posted in Illusion, Metaphysics of Time, representation, Space and tagged Dublin, external things, Intentionalism, presentism, Representationalism, Science Gallery, Spatial phenomenology, the author's explicit metaphysical commitments, Trinity College on March 18, 2013 by timeandillusion2012.